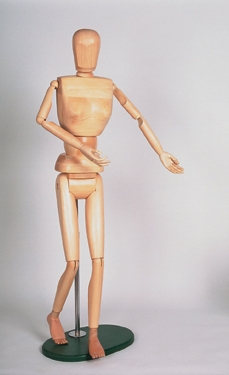 A stunning wooden life size female manikin which can be easily adjusted into several positions. Great for art instruction and classrooms, this manikin sits at 68” tall (5’8”) and is easy for a whole classroom to see. Comes with a stand and it is handmade from hardwood. Wood is unfinished. The model ships on truck because of the large size. A great tool to learn how to draw the female form for any new artist or experienced artist. Will last for years with maintenance and care, it is durable and built with quality and an attention to detail.